Here's a CD one doesn't expect from Naxos! They've recorded music in just about every genre, but they haven't made much of a mark in the classical avant garde – until now! The ondes Martenot (or "Martenot waves," a reference to inventor Maurice Martenot) is one of the earliest electronic instruments, only slightly predated by the theremin. Its timbre is similar to that of the theremin, but it is capable of more varied sounds, and it is played in a more traditional way, i.e., there is a keyboard, and also a "ribbon" parallel to the keyboard which makes glissando effects easier to achieve. Timbre and volume are controlled by switches and knobs in a drawer on the left side of the instrument. These also can be controlled by foot pedals, when both hands are needed on the keyboard or ribbon. In classical music, the most famous use of the ondes Martenot is in the Turangalîla Symphony, and in several other works by Olivier Messiaen. The ondes Martenot has not been manufactured since 1988, eight years after the death of its inventor, but a digital-era successor has been developed. 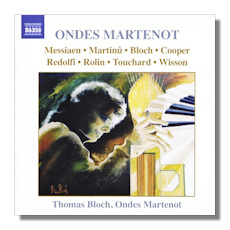 This CD presents an array of mostly recent works for the Ondes Martenot. The most substantial work, however, is Bohoslav Martinů's melting Fantaisie for Ondes Martenot, piano, oboe, and string quartet, written in 1944. Here, the instrument is presented in its most hauntingly lyrical guise. Seraphic lyricism also is central to the fourth of Messiaen's Feuillets inédits, and performer Thomas Bloch's Sweet Suite, written as recently as 2003. There's more to this instrument than spacey moon-tunes, however. Nightmare, a work by Lindsay Cooper, with words by Bosnian poet Abdulah Sidran, lives up to its name as it depicts the desperation of living in Sarajevo. In a lighter vein, there is Olivier Touchard's Euplotes 2, a musical depiction of a paramecium-like creature, in which the ondes Martenot is joined by other electronics. Or what about Michel Redolfi's Mare Teno, which is derived, in part, from the composer's brain waves? Or what about Bernard Wisson's exciting Kyriades, a double concerto for Ondes Martenot, piano, string orchestra, and percussion? Or finally, Bloch's own Lude 9.6, which, like the Sweet Suite, brings us nine ondes Martenot at once? Most of these are world première recordings; several of them are live. Thomas Bloch was born in France in 1962, and he plays not just the Ondes Martenot, but also the glass harmonica, and its sister instrument, the crystal Baschet. Far be it for me to judge him on his technical abilities, but suffice it to say that I was wowed by everything I heard on this CD, which, while sometimes ethereal and at other times outrageous, is always musical. Not all of the music is profound, but it sure is fascinating! If you're looking for the perfect holiday present for the collector who has everything, look no further. And while you're at it, get one for yourself!